I forgot what day it was until I turned on the tv this morning and saw the memorials taking place in NYC. It get so choked up and I'm sure I always will. Six years ago today the world changed forever...an innocence was lost...a new reality set in...a heavy heart. I'm scanning in my old photographs from film days, a multi-decade project, and came across this one. 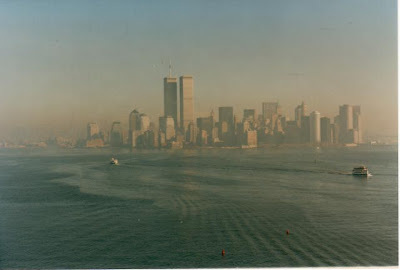 Taken in 1994 on the ferry to Ellis Island. The first is the scanned in image; the second is the PS one. PS - cropped, straightened, healing tool, curves adjustment, +contrast, defog, noiseware. LOVE that you can PS scanned images! Remembering this somber day, those that lost their life, the family and friends who were forever changed, those who fight for our freedom. Hoping the world sees many positive, kind changes soon. In Remembrance. Very cool photo, I love the glow it has!! 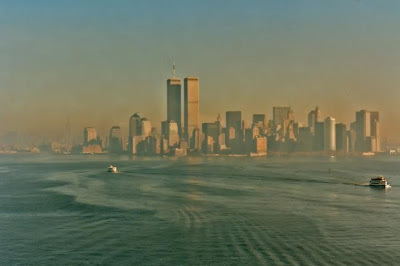 Lucky for you to capture the twin towers. These are beautiful. Love the haze & the way the water is rolling. very fitting on a day like today. The Busy Season is Here!